Pulp Strategy Communications, a multi-award-winning agency in the realm of experiential, digital & interactive marketing is making the world go on a rescuing spree with its latest mobile game app launch ‘Rescue’em’. If rescuing cute little creatures from the fierce claws of the villain makes a part of your day’s schedule, then Rescue ’em is the game for you. 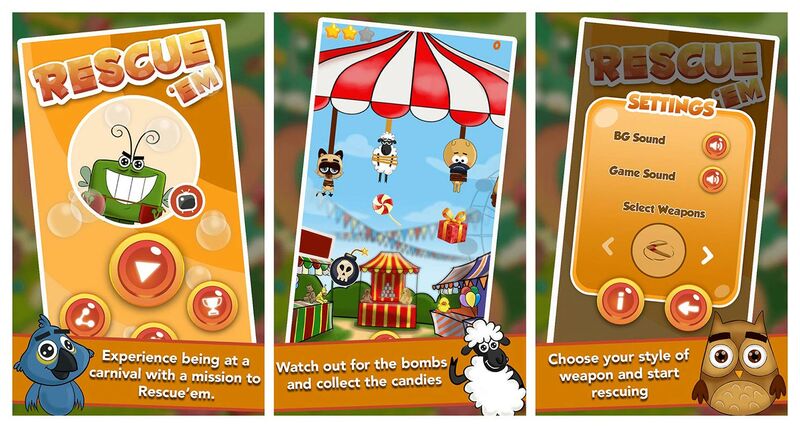 Rescue ’em is the new game on iOS and Android that packs the excitement of being at a carnival with a mission of rescuing adorable creatures suspended by a rope. The colourful background, cute characters, smooth interface, and simple tap-to-play mode not only make the game attractive to kids, but also helps them improve hand-eye coordination and works as a stress buster for adults, diverting their mind from daily worries with compelling gameplay. The characters are also individuals in their own right; with twitter style bios that make you associate with them immediately. Each of us know at-least one BUBBA or one person who could be Pugsy. Brutus is a mean merchant from Carnival Island. He travels from island to island-abducting cute little creatures, and sells them off to make a living. Bubba: Under the thick and woolly coat is the timid and shy Bubba. He flutters his eyes and hears each word and likes to stick to his comrades. Pugsy: is a troublemaker who chews almost everything that comes his way. The only drill he likes is to roll over some warm gooey mud. Various cute characters in the game are suspended by a rope abducted by a villainous character called Brutus who has sold them at a carnival island. A simple tap on the rope binding these characters releases a boomerang that unties them. There are also various other objects like poisonous mushrooms, candies, bombs, and gift boxes that appear on the screen with their own attributes lending a different flavour to the game. The interesting scoring structure enables you to win points on collection of Candies, releasing a Boomerang or a Flying Disc or revive lost lives by tapping on the Gift Box. On the other hand, collecting mushrooms can cost you the loss of points while tapping on the Bomb, letting 5 characters pass by and dropping Candies can result in the loss of one Life each. Here’s your chance to become heroic and rescue some adorable creatures from the evil clutches of Brutus with ‘Rescue’em’. Get set for some compelling gameplay!